This title is available for Special Order. Please note this item is currently not a stock item. We place orders with the publisher every month so can order a copy in for you. If you order this game, along with other instock titles, your order will ship when the Special order games come into stock. On 18 July 1936, various generals in the Spanish army rose up against the government of the Second Republic. The failure of the coup as it had been originally planned gave way to a civil conflict between the defenders of the democratic government and the backers of the military coup. Machado’s two Spains fought each other for nearly three years in a battle which reflected the political and social tensions affecting the world at that time. The opposing armies were very different: on one hand, the Republican army possessed a limited number of professional soldiers and many popular militias belonging to political parties and labor unions. To this were added the International Brigades, formed from foreign volunteers of diverse origin; a fighting force which was highly motivated, but poorly coordinated and typically poorly organized. On the other hand, Franco´s army had most of the professional military, along with Carlist and fascist militias, many native Moroccan troops, and the volunteers of the Condor Legion and the Corpo Trupe Voluntarie sent by Hitler and Mussolini respectively. A las Barricadas!, the first title in the War Storm Series, is a game that simulates the battles which took place on the different fronts of the war, at platoon and company level. The rules are oriented towards the tactical simulation of combat involving armored vehicles, infantry, artillery, and aircraft, and as such are especially suited to represent almost any 20th century armed conflict as it actually happened. 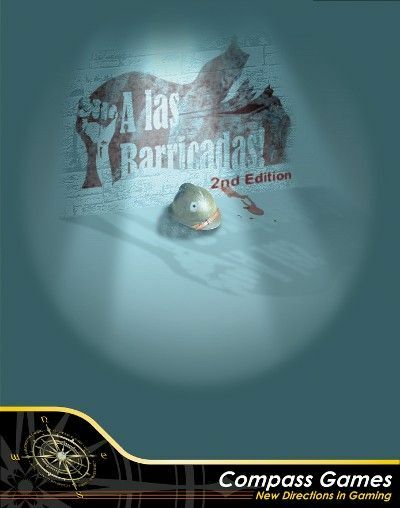 This new edition of A las Barricadas! is a major upgrade over the earlier game. With updated and rewritten rules, improved and illustrated examples, a new scenario, nearly double the number of counters all with updated graphics, the Compass edition is a must-have for your gaming collection.